Most of theater history belongs to actors and playwrights, but in the 20th century the stage became largely the domain of the director. Visionary and charismatic individuals have brought bold conceptions to theater and opera, reinterpreting classic plays, reinventing approaches to acting and investigating the relationship of the spectator to the stage. In the second half of the 20th century, no director has had more influence or recognition than Peter Brook. Peter Stephen Paul Brook (born 1925) is an English theatre and film director, producer and innovator, who has been based in France since the early 1970s. As a child, Brook performed his own four-hour version of Shakespeare’s Hamlet at the age of seven. After spending two years in Switzerland recovering from a glandular infection, Brook became one of the youngest undergraduates at Oxford University. At the same time he wrote scripts for television commercials and introduced to London audiences his first professional stage production, Marlowe’s Dr. Faustus. Brook, did his first production at Stratford Theatre, one of the world’s most prestigious stages, at the young age of 21. It was Shakespeare’s Loves Labours Lost. He spent the next several years staging acclaimed productions of plays. He worked at the Covent Garden directing opera, as well as designing the sets and costumes for his productions. Always seeking innovations and styles which would make his productions speak to modern audiences, he ended this experience with opera by calling it “deadly theater.” He directed plays with prominent actors, including Laurence Olivier in Titus Andronicus and Paul Schofield in King Lear. In 1961 Peter Brook directed one of his seven films, the chilling Peter Shaffer adaptation of Lord of the Flies. In England, Peter Brook and Charles Marowitz undertook The Theatre of Cruelty Season (1964) at the Royal Shakespeare Company, exploring ways in which Artaud’s ideas could be used to find new forms of expression. The result was a showing of “works in progress” made up of improvisations and sketches, one of them was the premier of Artaud’s “The Spurt of Blood”. Brook’s work is also inspired by the theories of experimental theatre of Jerzy Grotowski, Bertolt Brecht, and Vsevolod Meyerhold and by the Edward Gordon Craig, and Matila Ghyka. His major influence, was Joan Littlewood. Brook described her as “the most galvanising director in mid-20th century Britain”. Brook’s productions of “King Lear,” “The Tempest” and “A Midsummer Night’s Dream” between 1962 and 1970 galvanized theater audiences and also the practitioners. In the process, not incidentally, Brook helped cement the reputation of the newly founded Royal Shakespeare Company. 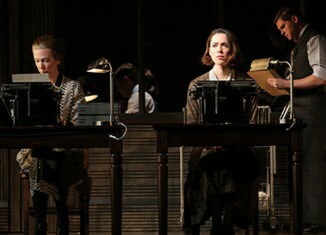 Gone were romantic and quasi-realistic settings, replaced by austere yet bold stenography that often revealed the mechanics of the stage and created startling visual effects while emphasizing the theatricality inherent in the texts. A highly physical, even acrobatic approach to acting from rigorously trained ensemble casts shifted the emphasis from rhetoric to action. The most notable production to come out of this experiment was the landmark 1964 production “Marat/Sade” by Peter Weiss, in which the actors transformed themselves into the inmates of the mental asylum at Charenton, where they restaged the French Revolution under the guidance of a fellow inmate, the Marquis de Sade. So believable was the acting that audiences were often too stunned and terrified to applaud. Few of Brook’s experiments were, strictly speaking, new. He was, however, one of the most successful directors since Max Reinhardt in the 1920s at bringing avant-garde approaches in acting and staging to institutional theaters and thus to mainstream audiences. The result was revolutionary, the staging of the classics was forever altered. Following “Dream” in 1970, which toured the world, Brook made a seemingly radical departure, though, as Kustow explains, it was almost inevitable given Brook’s disaffection with British theater. Following a path that many 20th-century directors had taken, Brook withdrew from the public stage for three years and created a laboratory to investigate the very nature of theater. He gathered an international group of actors in Paris that would eventually become the International Center for Theater Creation. The company staged an original ritualistic work with an invented language, “Orghast,” for the Shiraz festival in Iran, and then embarked on an extended journey to Africa in an attempt to find a universal language of performance. This was followed by travels around the United States where they worked with the Teatro Campesino in California and visited Indian reservations to observe Native American performance practices. 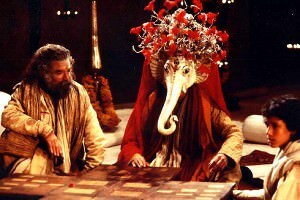 In the mid 1970s,Brook, with writer Jean-Claude Carrière, began work on adapting the Indian epic poem the Mahabharata into a stage play which was first performed in 1985 and then later into a televised mini series. From 1974 on, however, the output of the company was prodigious. Much of the deceptively simple work that his company created could be classified under Brook’s famous category of “holy theater” – one of spiritual intent that seeks to reveal the hidden aspects of life. Often these productions were performed on a nearly bare stage with little more than a few carpets as scenery. Perhaps influenced by Brook’s lifelong fascination with Gurdjieff, the results were often revelatory, provocative, even mystical, as in a stripped-down production of “Carmen,” but with the exception of the epic “Mahabharata,” none equaled the grandeur or spectacle of Brook’s earlier work. Despite Kustow’s access to Brook, there is little in his biography that is not already known. It fills in some details missing from Brook’s more elegant memoir, “Threads of Time” (1998), but borrows heavily from familiar published sources. 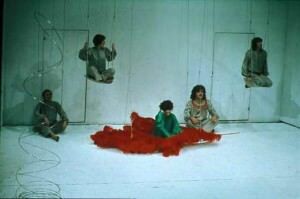 Among his later theatrical productions, which were mostly performed in Paris, are Peter Handke’s Kaspar (1972); Timon of Athens (1974); Ubu aux Bouffes (1977; “Ubu with Bouffes [the theatre company]”), an adaptation of Alfred Jarry’s Ubu Roi (“King Ubu”); Antony and Cleopatra (1978); Woza Albert! (1989); and The Tempest (1990). Brook also wrote and directed such films as The Lord of the Flies (1963), King Lear (1971), Meetings with Remarkable Men (1979), Swann in Love (1984), and The Mahabharata (1989), based on the ancient Indian epic of the same name. In two books, The Shifting Point: Forty Years of Theatrical Exploration, 1946–1987 (1987) and The Open Door (1993), Brook extended his continuing reflections on aspects of the theatre. He was made a Companion of Honour in 1998. That same year he published a memoir, Threads of Time. In 2002 Brook directed a BBC television production of Hamlet. In 2005 Brook directed Tierno Bokar, based on the life of the Malian sufi of the same name. The play was adapted for the stage by Marie-Helene Estienne from a book by Amadou Hampate Ba (The Inspiring Life of Tierno Bokar). The book and play detail Bokar’s life and message of religious tolerance. 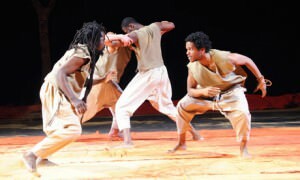 Columbia University produced 44 related events, lectures, and workshops that were attended by over 3,200 people throughout the run of Tierno Bokar. Panel discussions focused on topics of religious tolerance and Muslim tradition in West Africa. Who is Really Sarah Kane?? ?